Making the automotive customer experience that much better…your one stop spot for everything and anything about cars and trucks. Reaffirming its position as an ideal family road-trip machine, today the all-new 2014 Nissan Rogue was named “Best Crossover” in the 2014 Parents and Edmunds.com 10 Best Family Cars list. The award comes on the heels of news that the 2014 Rogue set yet another sales record in May 2013. For the seventh straight year, car experts at Parents and Edmunds.com evaluated hundreds of vehicles to determine which are best suited for families. This year, the top 10 were chosen based on safety, convenience and high-tech performance features at all price levels. As a recent Insurance Institute for Highway Safety (IIHS) “Top Safety Pick Plus” – coupled with best-in-class cargo capacity*, best-in-class starting price**, best-in-class highway fuel economy*** and innovative, class-exclusive**** features such as the EZ Flex™ Seating System, Divide-N-Hide™ Cargo System and available Around View Monitor® – the 2014 Nissan Rogue met the judges’ criteria across all categories. The Nissan Rogue, which was completely redesigned for the 2014 model year, features bold, emotive styling, a premium interior created with comfort and multi-tasking in mind, and an array of available affordable technologies. 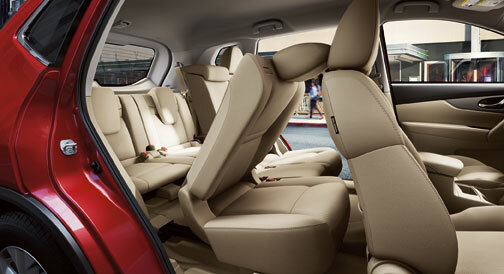 Rogue offers optional 3-row/7-passenger seating, along with exceptional passenger and cargo flexibility. Every 2014 Nissan Rogue is equipped with a responsive 2.5-liter 4-cylinder engine rated at 170 horsepower and 175 lb-ft of torque. The engine is matched with an advanced Xtronic transmission. Rogue comes in three well-equipped models, S, SV and SL, each in a choice of front-wheel or all-wheel drive. The complete 2014 Parents and Edmunds.com 10 Best Family Cars list will be published in the July 2014 issue of Parents magazine and is available online at Parents.com/best-family-cars. Windsor Nissan in East Windsor, NJ is proud to sell the highly recognized 2014 Nissan Rogue and currently has a full inventory of small crossover Rogues @ 590 U.S. 130 on sale right now!!!! 1. Breakthrough Design. Not only does the all-new 2015 Nissan Murano look like nothing else in the segment, its 0.31 coefficient of drag (the same as many contemporary sports cars) is projected to be among the best in segment. Key contributors to the low aerodynamic Cd include the lower grille shutter, front and rear spoilers, rear tire deflectors, rear suspension fairings and optimized fuel tank design. 2. Tuned LED Headlights. The available LED headlights, while providing excellent energy use efficiency and durability (versus halogen and xenon lights), required extensive tuning to refine the shape and light intensity. Murano also features standard LED Daytime Running Lights, LED taillights and integrated LED lights in the sideview mirrors. 3. Zero Gravity, Extra Heat. Murano backs up its position as a “social lounge” by treating rear seat passengers to many amenities usually reserved for front seat occupants. This includes rear Zero Gravity outboard seat design, available high-speed seat heating and rear USB connection port. Rear seat knee room has increased by 1.4 inches (versus the previous Murano) due to a slimmer front seat seatback design. 4. Less Weight, Better MPG. The new Murano features an approximate 130-pound overall weight reduction, which when combined with optimized aerodynamics, low rolling resistance tires, engine and transmission enhancements and other drivetrain improvements, is projected to result in an approximately 20 percent gain in combined fuel economy versus the previous generation Murano (2015 Murano EPA fuel economy ratings not yet available). 5. Extra Set of Eyes. The new Murano includes up to four onboard cameras and three radar systems, to provide input to a range of standard and available technologies including Blind Spot Warning (BSW), Predictive Forward Collision Warning (PFCW), Forward Emergency Braking, Intelligent Cruise Control, Cross Traffic Alert (CTA) and class-exclusive Around View® Monitor with Moving Object Detection. 6. Let There Be Light, Lots of It. The Murano’s available power Panoramic Moonroof has been reconfigured for the new third-generation design. A single opening replaces the previous two separated panels and the glass area is a 40 percent longer sliding length, with the opening area increased by 29 percent (versus the previous generation Murano). 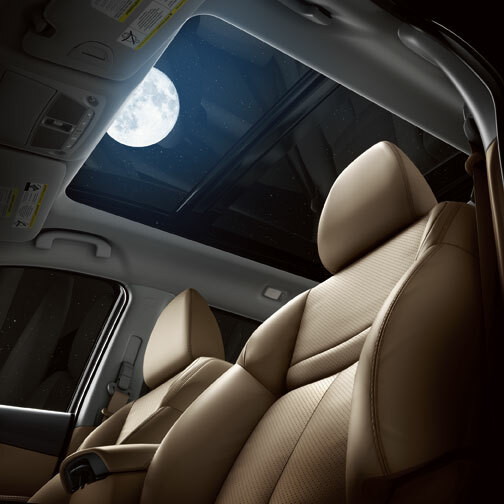 The new Murano also an advanced lighting system, welcoming occupants to the premium interior day or night. 7. Off with the Switches. Murano’s new instrument panel is designed for ease of use. Along with larger information screens, such as the 7.0-inch high resolution customizable Advance Drive-Assist Display and available 8.0-inch multi-touch control center display, the number of audio and navigation switches has been reduced by 60 percent (from 25 to 10) for a more user-friendly experience. 8. 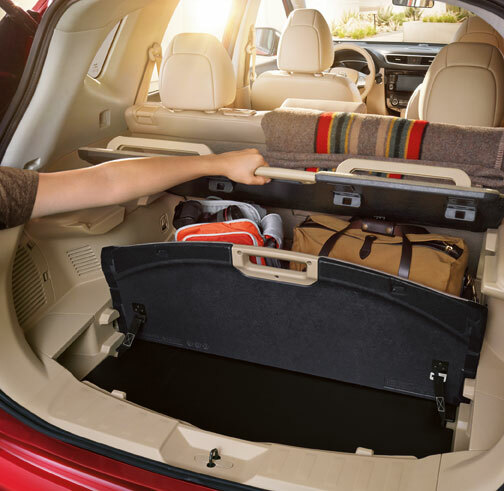 Clutch Cargo (Area): Not to be overlooked among all the premium design features of the new Murano is its utility. The rear cargo area dimensions have been stretched 3.3 inches in width and 2.0 inches in length, which along with the reconfigured shape of the rear liftgate, results in four extra cubic feet of cargo space – projected to be among the largest cargo area in the segment. Cargo is now also easier to load with the fold-flat rear seats creating a flat luggage floor. The split-folding rear seat, with available power return, can be controlled completely from the cargo area – so there’s no need to walk to each door to raise the seats. 9. 1st in the U.S. The 2015 Murano will be assembled for the first time in the United States (the previous two generations were produced in Japan), becoming the ninth model in production at the Canton Vehicle Assembly Plant in Canton, Mississippi. Murano will be exported from Mississippi to more than 100 markets around the world. 10. Growing Market. The first-generation Murano was launched in November 2002 as a 2003 model. Nearly 700,000 have been sold in the U.S. to date. The mid-SUV segment is projected to increase 19 percent between 2013 and 2016. Key vehicles in the segment include Ford Edge, Hyundai Santa Fe Sport and Kia Sorento. Windsor Nissan in East Windsor, NJ is thrilled with the upcoming release of the all-new 2015 Nissan Murano crossover. We know that this vehicle will be an amazing addition to our already award winning lineup; the Nissan Altima, Nissan Sentra, Nissan Pathfinder, Nissan Maxima & the all-new 2014 Nissan Rogue. We cannot wait for Fall 2014! All-New 2014 Nissan Rogue Named to Kiplinger’s “2014 Best Value Awards” Winners; the redesigned rogue continues to build up an impressive mantle of trophies. The Rogue has been fully redesigned for 2014 and Nissan hit a grand slam by creating an even better small crossover than we could have imagined. The all-new 2014 Nissan Rogue is extremely competitive on equipment & efficiency compared to other small crossovers, and it excels in refinement, styling & technology. The more aggressive look inside and out projects a more masculine look that resembles the front fascia of the all-new Pathfinder that came to market at the end of 2013. The headlamps even resemble the front lights of the new Audi sedan that you see racing up and down the New Jersey Turnpike. Prior to receiving this distinguished award from Kiplinger, the all-new 2014 Nissan Rogue was named by Kelley Blue Book’s KBB.com as one the 12 Best Family Cars. KBB.com recognized the Rogue’s “wealth of amenities and clever cargo solutions” like the Divide-N-Hide cargo system. The editor stated that the Rogue was “surprisingly good at accommodating a rear-facing booster seat while still giving front passengers good legroom.” More importantly, the vehicle was also touted as a top 12 vehicle for a practical family because the 2014 Nissan Rogue is a wonderful selection for inexpensive transportation. Now getting back to the Rogue’s most recent headline, Kiplinger’s Personal Finance has named the 2014 Nissan Rogue the “Most Fuel-Efficient Small Crossover” in their most recent publication of 2014 Best Value Awards. It is plain & simple; the 2014 Nissan Rogue has amazing fuel economy at an affordable price! The Rogue’s success has not only been measured in awards. The vehicle set a January 2014 sales record with 13,831 deliveries in its first full month of sales, which was a 54.5% increase compared to one year earlier. Here at Windsor Nissan, we have not been able to keep the all-new 2014 Rogue on the lot for more than a day or two. Each time we get a new Rogue off the trailer, we have another happy sales customer lined up for delivery. Nissan’s tagline, Innovation that excites, is spot on for the new Rogue. The technology is outstanding – I’ve yet to see a better built-in navigation system. The navigation system’s seven-inch color touchscreen refreshes with impressive fluidity and the nav is way quicker to respond and far more intuitive to use compared to other small crossover vehicles sold by the competition. The Bluetooth is reliable and super fast connecting. Plus, the mini-screen that you can see through the steering wheel is a great touch. I love the AroundView monitor; the moonroof is huge and makes the driving experience extremely pleasant. Finally, the power liftgate is excellent and convenient to use. As an economy-oriented family hauler, the all-new 2014 Rogue small crossover delivers on all fronts. “Nissan carefully checked-off the segment’s objective requirements of a roomy cabin, all-weather capability, solid fuel economy, interesting styling and innovative technology,” as stated by autoblog.com. Dealers such as us, Windsor Nissan, could not be more proud to sell this awesome, value-packed vehicle. The premium style and features combined with the available 3rd row seating option make the 2014 Nissan Rogue the premiere choice for New Jersey auto shoppers seeking to buy a comfortable and highly functional small crossover SUV. Windsor Nissan invites you to 590 U.S. 130 in East Windsor, New Jersey to see exactly why companies like Kelley Blue Book and Kiplinger continue to brag about this superb Nissan vehicle. Windsor Nissan’s Season To Choose Sale; Black Friday and Cyber Monday Car Specials! Save now on Windsor Nissan’s most innovative line-up ever. 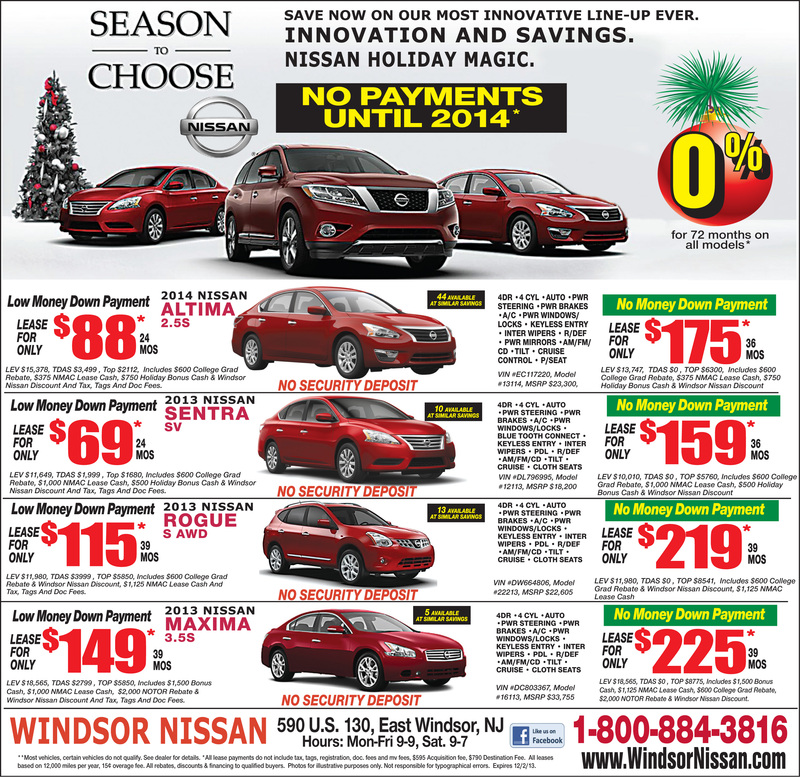 Innovation and Savings is Windsor Nissan’s Holiday Magic! East Windsor, NJ – Sales Manager Michael Castiello has announced today that Windsor Nissan is planning another hugely successful $990 Pre-Owned Vehicle Sale this Friday, November 29th at 9:15AM through Monday, December 2nd at 9:00PM to celebrate the annual retail sales holidays, Black Friday & Cyber Monday. Windsor Nissan ran a similar event in October and stunned a number of competitors. Customer who participated in the last sale event have raved about the tremendous deals they received and can’t get over the fact they were able to purchase such quality used vehicles at such low prices. To the surprise of many, consumers were even able to take advantage of unprecedented sale offers on New Nissan vehicles, which included leasing and financing deals. As a result, the management team at Windsor Nissan has decided to enhance their 3-Day Black Friday, Cyber Monday Sale by including all-time low lease payments, sign & drive lease offers and Certified Pre-Owned Vehicles marked down more than 25% from original MSRP. This sale is taking place at Windsor Nissan 590 US 130 East Windsor NJ, just minutes from Route I-95 and Route 1. Registration starts at 9:00AM. Vehicles will be clearly marked, so come early for the best selection. Windsor Nissan believes that reviving the economy starts at home, and that changing things locally will lead to changing things nationally. Customers are encouraged to arrive as early as 9:00AM. Every vehicle will be cleaned, detailed, and fully prepared for instant delivery. At 9:15AM, Castiello and Gilley, with their sales team, will mark the special sale price on each and every vehicle. And because Windsor Nissan customers are feeling the credit crunch right now, Ownership has given the dealership’s financing manager the resources necessary to get most customers’ credit approved on the spot. Loan processing and financing representatives will be on-site during this Black Friday / Cyber Monday Sale Event to ensure prompt credit approval and same day delivery of all sold vehicles. This means that customers with “less than perfect” credit history can have their credit approved and drive a quality pre-owned car, truck, van, SUV, or even a new Nissan home. Even if a customer’s credit report shows a bankruptcy, divorce, tax lien, slow payment history, missed payment, or repossession, or if a customer is a first time buyer, Windsor Nissan will accept all applications. This special, 3-DAY BLACK FRIDAY & CYBER MONDAY $990 Vehicle Sale will be held in East Windsor, NJ this Friday, November 29th at 9:15AM through Cyber Monday, December 2nd at 9:00PM. Customers are encouraged to register as early as 9:00AM. Incredible sale prices, starting as low as $990, will be posted no later than 9:15AM. Michael Castiello also reminds customers that the holiday sale event is first-come, first-served, so it’s critical to come early to have the best chance of getting the vehicle of your choice. Customers wishing to trade in a vehicle are asked to bring their title or payment book for immediate delivery. Windsor Nissan will even pay off your trade-in in full, no matter how much you still owe on it. Negative equity will carry forward. Most of these surplus pre-owned vehicles will get sent directly to auto auctions for liquidation. So, if anyone has been thinking about purchasing a good, clean, dependable pre-owned car, truck, van or sport utility vehicle, do not miss this special one-day only sale. For more information about this sale at Windsor Nissan, please contact them at: 1-800-884-3816. East Windsor, NJ – General Manager Michael Maguire has announced a $990 Pre-Owned Vehicle Sale on Friday, October 25th at 9:15AM and ends on Monday October 28th at 9PM. This sale is taking place at Windsor Nissan 590 US 130 East Windsor NJ, just minutes from Route, I-95 and Route 1. Registration starts at 9:00AM. Vehicles will be clearly marked, so come early for the best selection. Windsor Nissan’s pre-owned inventory levels need to be reduced to make room for the arrival of additional 2014 Nissan models. As a result, Windsor Nissan is selling these additional pre-owned vehicles to the public at drastic discounts in an attempt to help its core customers get back on the road. These are the regular folks who are feeling this economic downturn the hardest. In addition to Windsor Nissan’s extra inventory, additional vehicles have been acquired at incredible prices from various banks, repossession companies, auto auctions, credit unions, lease companies, and rental companies for this sale. Customers are encouraged to arrive as early as 9:00AM. Every vehicle will be cleaned, detailed, and fully prepared for instant delivery. At 9:15AM, Michael Maguire and his team will mark the special sale price on each and every vehicle. And because Windsor Nissan customers are feeling the credit crunch right now, Mr. Maguire has given the dealership’s financing manager the resources necessary to get most customers’ credit approved on the spot. This means that customers with “less than perfect” credit history can have their credit approved and drive a quality pre-owned car, truck, van or SUV home. Even if a customer’s credit report shows a bankruptcy, divorce, tax lien, slow payment history, missed payment, or repossession, or if a customer is a first time buyer, Windsor Nissan will accept all applications. This special, THREE DAY ONLY $990 Pre-Owned Vehicle Sale will be held in East Windsor on Friday, October 25th at 9:15AM and end on Monday, October 28th at 9PM. Customers are encouraged to register as early as 9:00AM. Incredible sale prices, starting as low as $990, will be posted no later than 9:15AM. All vehicles will be sold on a first come, first serve basis. Windsor Nissan is expecting a high volume of customers for this sale, so be sure to reserve your spot early. Customers wishing to trade in a vehicle are asked to bring their title or payment book for immediate delivery. Windsor Nissan will even pay off your trade-in in full, no matter how much you still owe on it. Negative equity will carry forward. Most of these surplus pre-owned vehicles will get sent directly to auto auctions for liquidation. So, if anyone has been thinking about purchasing a good, clean, dependable pre-owned car, truck, van or sport utility vehicle, do not miss this special one day only sale. 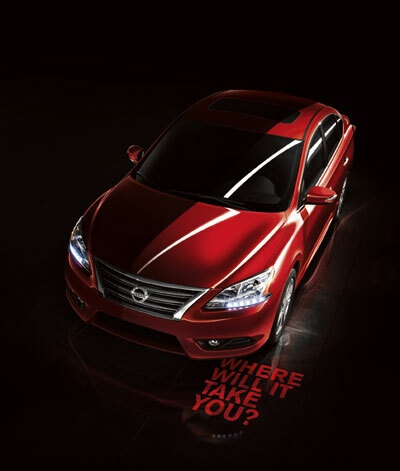 The newly redesigned 2013 Nissan Sentra was named Best-In-Class Compact Car in AutoPacific‘s 17th annual Vehicle Satisfaction Awards (VSA), topping a list of 15 other vehicles. An industry benchmark for measuring how satisfied an owner is with his/her new vehicle, AutoPacific’s VSA are based on the results of responses from more than 52,000 new vehicle owners. VSA vehicles are assessed on 51 separate attributes, ranging from interior comfort to fuel economy and performance to determine owner satisfaction. Sentra’s all-new design is elegant, modern and refined. It offers a high-quality interior design with available features not usually found in compact vehicles, including dual-zone auto temperature control, Bose® premium audio system, and a navigation system with hands-free text messaging assistant. Sentra includes several changes contributing to the increased fuel savings. The 2013 Sentra is 150 pounds lighter than the outgoing model, yet has slightly larger overall dimensions and more interior room. The lighter and more aerodynamic Sentra also uses a more fuel-efficient 1.8-liter engine, which along with its next-generation Xtronic CVT® with sub-planetary gear helps deliver a 13 percent improvement in EPA combined fuel economy (over the prior model year). Fuel economy is rated at 30 miles per gallon city, 39 miles per gallon highway and a class-leading 34 miles per gallon combined with the CVT*. *2013 EPA Fuel Economy Estimate 34 MPG combined 50-state emissions and CVT transmission; 33 MPG combined CA state emissions. Actual mileage may vary — use for comparison only. Ward’s Light Vehicle Market Segmentation. MY13 Sentra vs. 2012 Upper Small Class excluding Hybrid and Diesel models.